We all have times when we fail, so it’s important you look at it with the correct perspective. Losing has a way of getting your attention, and if you choose you can turn every loss into a learning experience that will bring about greater success in the long run. Instead of feeling sorry for yourself, making excuses and blaming other people, choose to make your failures a learning experience. Remember, there’s winning, and then there’s learning. Pay attention to details. It’s always the little things that lead to big results. If you have experienced a lot of wins it’s easy to get caught up in the winning and forget that it’s the attention to details that got you there. A loss has a way of making you aware of the lack of focus on details. Make a check list of all the “little things” that are essential to your success, and communicate to everyone on your team the importance of paying attention to every detail. Don’t take things for granted. A win streak can cause you to take things for granted. Effort and execution are not automatic. It takes a conscious decision to give maximum effort, and an intense focus to execute the game plan. Thinking you can give less effort, or get away with slightly less than your best focus on executing the game plan will eventually catch up to you. Focus on what you can control. When things aren’t going well, it’s easy to get focused on the wrong things. In every walk of life there are things you can control, and there are things you can’t control. After experiencing a loss, you often see how your focus had shifted to the wrong things. Never allow your energy or resources to be spent on things you have no control over. When circumstances are difficult, when things aren’t going well, that’s when you need to give extra attention to the things you have power to change. The next time you experience some sort of defeat, don’t waste anytime feeling sorry for yourself, but rather pick yourself up, dust yourself off, and spend some time learning from the failure. 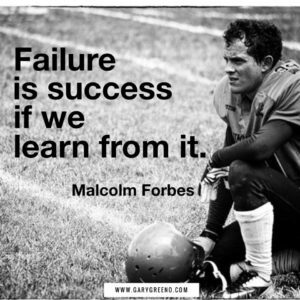 John Maxwell says, “Learn to fail forward”. This is possible when you decide to do so. Keep up the good fight, and know that I believe in you! You’ve got what it takes.